It’s not often that the Winter Olympic Games come with an ocean view, but that’s what we are getting this year at the Black Sea resort of Sochi, Russia. Sochi is the warmest city ever to host the Winter Games, which officially run February 7–23. 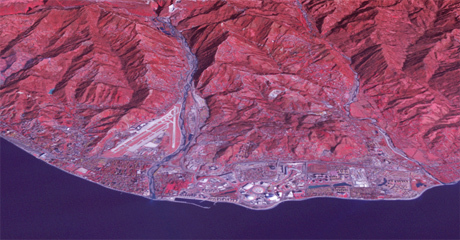 Two images of the Sochi Olympic venues were acquired on January 4 by the Advanced Spaceborne Thermal Emission and Reflection Radiometer (ASTER) instrument on NASA’s Terra spacecraft. In the first image, above, the Olympic Park Coastal Cluster for indoor sports appears as a circular area on the shoreline. There’s a separate arena for curling, alongside multiple arenas for hockey and skating. The actual city of Sochi, which has a population of about 400,000, is not visible in the picture. A second image centers on the Rosa Khutar ski resort in the mountains near Sochi. That’s where the alpine Olympic events will be held. The resort is in the valley at center, and the ski runs are visible on the shadowed slopes on the left-hand side of the valley. The runs may be rated double black diamond, but they’re not quite as steep as they appear in this image. Height is exaggerated 1.5 times to bring out topographic details.